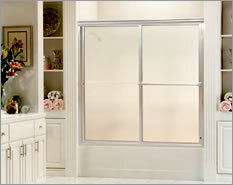 Our residential installation division specializes in mirrors, table tops, and shower & tub enclosures. Alumax Bath Enclosures is the largest producer of shower and tub enclosures in the U.S. with products including a complete line of bypass doors, pivot doors, hinge doors, steam units, heavy glass units, and mirror wardrobe doors. 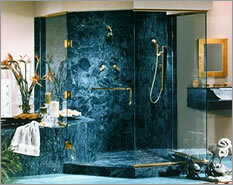 They produce both standard and custom units in a variety of quality finishes. C.R. Laurence Co., Inc. (CRL) is the leading supplier to the glazing, railing, architectural, construction, industrial, and automotive industries. Offering more than 50,000 products, the company serves the industry from locations throughout North America, Europe, and Australia. Today, C.R. Laurence is still the leading supplier of products to the glazing industry.They also design, engineer, and manufacture a wide variety of architectural hardware, including commercial and residential architectural railings, hardware for "all-glass" commercial entrances, transaction hardware, and frameless shower door hardware.